The Lotus Evora is turning out have a lot in common with the Pagani Zonda, in that there’s always a new special edition being released every now and then. Here’s another, the Evora GT430 Sport, which the company says is the new fastest road-going Lotus ever. Despite the longer name, the new variant actually makes do with less items compared to the standard Evora GT430 that was released in July. As you’ll be able to spot, the massive rear wing, front wheel louvres and aggressive front splitter have been done away with. The GT430 Sport continues to employ 19-inch wheels at the front and 20-inch ones at the rear, although the latter are slightly narrower (9.5J against 10.5) than those on the GT430. As a result, the accompanying Michelin Pilot Sport Cup 2 tyres are also different in size, with front 235/35 and rear 285/30 pairings. Of course, if you’re willing to pay a bit more, you’ll get the same ones as those on the standard GT430 – front 245/35 and rear 295/30 – with the matching wheels as well. Customers will also get to choose from a silver or matte black finish for both sets of forged aluminium wheels. Nonetheless, the car will still retain goodies like the Ohlins TTX two-way adjustable dampers, J-grooved and ventilated brake discs, all round AP Racing four-piston calipers, a Torsen-type limited slip differential (LSD) and an adjustable traction control system. The interior is similar too, with Sparco black leather/Alcantara racing seats and loads of black leather/Alcantara upholstery. Once again, if you want to pile on some extra weight, an integrated touchscreen infotainment system with iPhone connectivity, Bluetooth, satellite navigation and reverse camera is available as an option. Also carried over is 3.5 litre V6 engine that is paired with an Edelbrock supercharger, providing 430 hp at 7,000 rpm and 450 Nm from 4,500 rpm. That torque number is what you’ll get if you opt for the six-speed automatic transmission, but the six-speed manual version will have to make do with just 440 Nm instead. These figures are identical to what you’ll get on the GT430. 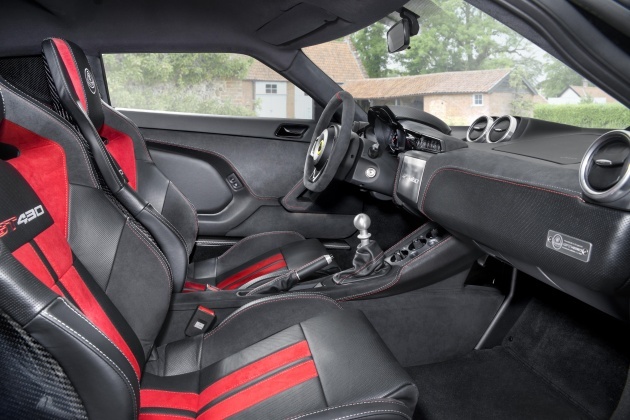 What is not identical are the performance figures, with the GT430 Sport being capable of hitting a top speed of 315 km/h (manual), which is 10 km/h more than the GT430 (also in manual). The automatic versions of both cars will top out at 280 km/h. According to Lotus, the reason for this discrepancy is the weight savings from the restrained aero package, which sees the GT430 Sport being 10 kg lighter in terms of dry weight when compared to the GT430 – 1,258 kg versus 1,248 kg (manual) and 1,269 kg versus 1,259 kg (automatic). That difference means the GT430 Sport generates up to 100 kg of downforce at its top speed, while the GT430 generates up to 250 kg at 305 km/h. Acceleration figures are identical, with the 0-96 km/h (0-60 mph) sprint being accomplished in 3.7 (manual) or 3.6 seconds (automatic). While the new car might have the higher top speed, it is the GT430 that is quicker around Lotus’ Hethel test tack with a time of 1 minutes 25.8 seconds. This is a full second faster than the GT430 Sport’s 1 minutes 26.8 seconds. For the UK market, the GT430 Sport is priced at 104,500 pounds (RM573,927), making it cheaper than the GT430 that goes for 112,500 pounds (RM618,559). Also, unlike the GT430, the new variant isn’t limited to 60 units worldwide. No worries, I forgip u for not knowing cuz just came out of cave. Do search on articles here about P1, Lotus, Geely. I think u still staying in caves. Dun u know the latest news of P1 selling Lotus? Do u even realise who they sold to? I know the new owner is not P1, do u? Stop putar alam here and there. Just answer who bought P1 shares & Lotus as well? Does it mean that all previous version super special bla bla bla evora are not good enough compare to this model. 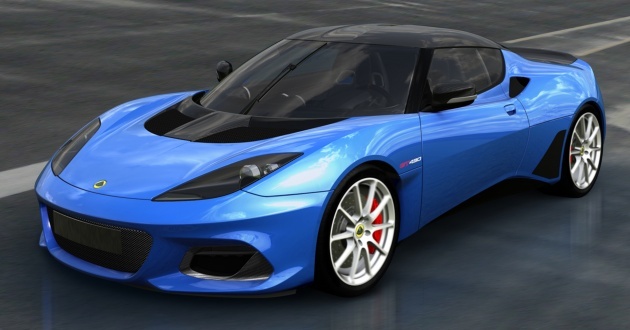 How many similar evora they want to produce? Pity. Just shy of the hypercar 200mph admision requirement….so famously fought over by the Porsche 959 and the Ferrari F40.